The Hidden Christian Sites in the Nagasaki Region comprise 12 locations connected to the distinctive cultural tradition of Hidden Christians. These – 10 villages, a castle and a cathedral - represent the 4 historic stages of that tradition. After introduction of the religion by a Jesuit priest in 1549, many people in the region converted. The Japanese rulers followed with a ban on Christianity (and foreign missionaries), that lasted until 1873. The religious practice however survived in its own vernacular version in remote communities. Nagasaki seems to have missed out on getting in early on the List, and will have a tough time making it now. Hiroshima has beaten it on the 'Peace'-theme, and I'm afraid Macao has done so on the 'European influences'-theme. So they're now aiming for the 'Christian'-theme, which has already 100 sites on the List! During my stay in the city in 2000 I visited Glover Garden, Dejima, the local Chinatown, the freaky Fukusai-ji Zen-temple, the temple route between Kofuku-ji and Sofuku-ji, the Urakami Atomic Bomb museum, and (yes!) Oura Church. 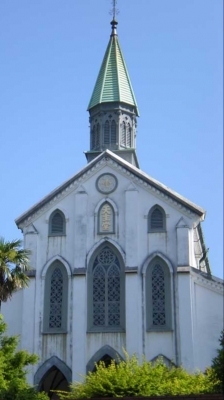 This probably is one of the proposed 'Churches and Christian Sites in Nagasaki', although you can't be sure as the sites are not named in the nomination file. Oura Church is a 19th century catholic church with, according to my traveldiary, 'beautiful stained glass windows'. Oura Church is easy to visit and combined with the Glover Garden next door. Of all the sites inscribed I think this is the only one not off the beaten path, after all the sites were supposed to be hidden. Wait wut? Reading the inscription I always thought they were about hidden sites, but in fact it is about hidden Christians practicing their faith after being outlawed in Japan, risking death and punishment they would move onto islands at the West coast of Japan and merge with Shinto shrines to cover up any sign of Christianity. Understanding this better I immediately had to ponder if this is special, and I mean, worldly special, and I am thinking no. I am also under the impression that this would open up inscriptions for e.g. Jewish hidden synagogues or Islam in a right-wing Europe if it ever comes that far. 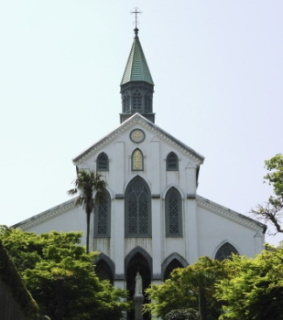 Anyhow, Oura Church is 150 years old and was the site where missionaries discovered that they were Hidden Christians in Japan who have been continuously keeping the faith while the missionaries were banned. I find the church more of a symbol than an actual sight worth visiting. Inside one can not even find a church but instead a museum about exactly the same subject. For non-WHS fanatics I could easily say they can skip the is but as a regular tourist visiting Nagasaki it's one of those things to add to the itinerary without much extra work, plus it gives you something new that you may never have heard about. As a church it is nothing special, especially for Westerners. If you want a superlative this is the oldest church in Japan. Visiting any other sites requires odd bus connections, ferries that may or may not be regular, prior notification to the local tourism board to arrange a time. The Nagasaki Church Information Center center can be helpful with that. Overall I find this an interesting piece of history and I am happy that Japan considers this as important history even though the remote locations are probably not getting any boosts from the WH status. Understanding the story of Kirishitan or Hidden Christian in Japan in the 16th and 17th centuries is mandatory to fully appreciate this nomination, strangely that in 1999 I have learnt the story of Kirishitan struggle after Shimabara Rebellion from 1997 Japanese anime, Rurouni Kenshin, after recommended from my friend because the story has many Dutch involved. 16 years later I arrived in Nagasaki and the memory from that anime especially the scenes of Oura Church vividly came back in my mind. 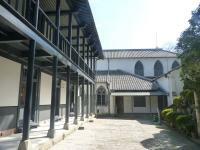 From 13 components, I had opportunity to visit 3 of them, Oura Church and its precinct which including Former Catholic Seminary and Former Residence of Archbishop, Shitsu Church, and Ono Church. All are in or nearby Nagasaki city area. I drove along the coastal road no. 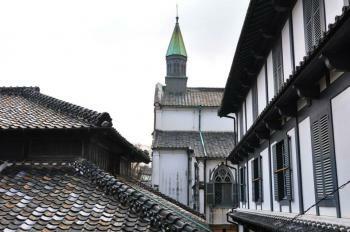 202 for about an hour from Nagasaki to small village of Shimo-onomachi where the 1893 Ono Church is located. When I reached the church, at first I was really surprised to see that this small stone church hidden in the forest hill really looked like someone house, the white statue of Virgin Mary is the only sign that this is a church, but after looked closely I really enjoyed the design of this place from unique sliding windows and strange foyer, a really interesting piece of architecture. The 1882 Shisu Church was my next destination. Located in the hilly Nishi-Shitsumachi Town along route 202, this church can be immediately seen when I reached the town limit. Very different from Ono, the Shitsu one is really looked like a Western church. The nomination document claimed that this church is characterized by its low and flat appearance and interior, built to take into account the strong winds, something that understandable but not obviously appreciated, and the interior is really plain that similar to typical Japanese large hall, anyway the bell tower is quite something to see. Next day I finally visited the 1853 Oura Cathedral, the building is exactly liked in the anime, a western styled church on the hill surrounded by gardens and usual Japanese snack and souvenir shops. In front of the church has a statue of Virgin Mary marking the spot where a group of villagers from Urakami came to meet a French priest and disclosed the existence of Kirishitan in Japan, a truly touching story for Vatican that Pope Pius IX declared this as 'the Miracle of the Orient'. Inside the church is quite fine with French stained glass window, I quite impressed with the faux Gothic vaulted ceiling made from bamboo by locals to imitate the art that they never have seen before. Then I went to the Former Catholic Seminary that exhibited the story of Kirishitan before continued to Glover Garden for another World Heritage Site nomination. To be honest the three churches I saw, they are quite underwhelmed, and there is nothing extremely unique in term of architecture. The thing I impressed are the small details of church design to accommodate Japanese culture and weather in Ono Church and the impressive work of local craftsmen who can built Gothic styled church from sketch of Oura Church by wooden and bamboo. It is very hard to distinguish Nagasaki churches from many other churches around the world especially colonial cities in Asia except the story of Kirishitan, that also very hard to interpret via church structure. Maybe other churches outside Nagasaki city area can provide more obvious uniqueness of Kirishitan's stories like I saw in many documentaries; for example, statue of Virgin Mary in disguised of Goddess of Mercy or the hidden cave churches. In my opinion the story of Kirishitan needs to be preserved in some kind of UNESCO program, but as a World Heritage Site? Only ICOMOS and WHC can tell. Nagasaki offers a lot to see and we “lost” over an hour going through immigration facilities for a mere 10 hour stay by being bussed from our vessel to another building and then being photographed and fingerprinted! But, in the shorter time left, as well as seeing the atomic bomb sites, the old Dutch island of Dejima, the Glover Gardens, numerous Buddhist and Shinto temples and, of course, the various “interests” to be found in a contemporary Japanese city, we knew that we also had to fit in some visits to the T list site “Churches and Christian Sites in Nagasaki! However, as Els says in her review below, the UNESCO Web site is very thin on exactly which locations are to be included. So, like her, we traveled “blind” taking in such Christian sites as we could find and as seemed likely to have “inscription potential” - however small!! On our return I carried out a more thorough Web search than I had done before departure and found this detailed Japanese site about the upcoming nomination http://www.pref.nagasaki.jp/s_isan/index.html (definitely have a look at the 10 minute movie). So, it turns out that there are 26 locations, only 7 of which are in Nagasaki City – and 3 of those are really in the same location at Oura. The other 19 are spread around Nagasaki Prefecture with 7 on the Goto Islands. Of the 7 in Nagasaki City we took in 5 during our day whilst fitting in all the other things to see! c. Site of the Martydom of the 26 Saints of Japan. 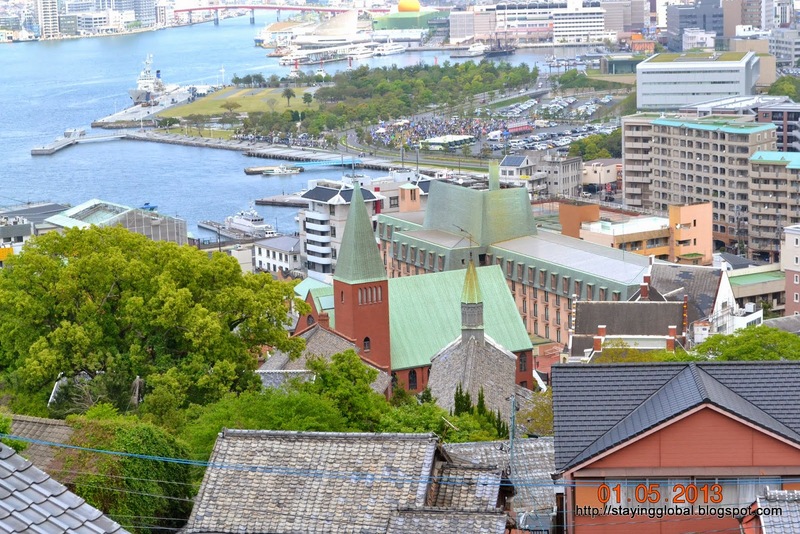 The area, close to Nagasaki train station, contains a memorial, a modern church and a museum. But it looks as if only the former is included. It is a reasonably striking relief depicting all the martyrs and was built in 1962 to commemorate 400 years since the event of 1597. It is now clear of course that, by seeing only the city locations, we had missed a couple of significant aspects of the entire site. First a couple of castles connected to the Shimabara rebellion of 1638 which led to the final crushing of overt Christianity in Japan and, second, the construction of Christian places of worship after the emergence of clandestine catholics towards the end of the 19th Century from their period of “hiding” in remote places across the prefecture. Nevertheless, some of the sites seem problematical. Does a memorial built in 1962 to commemorate an event 400 years earlier of which nothing physical remains have “OUV”? Another of the “locations” consists of a memorial hall displaying documentary etc mementos of a missionary (Fr M de Rotz - who came to Japan in 1868 and stayed until his death). Is such “movable heritage” of any significance for WHS status? And finally, many of the structures are not even originals from that first period of “re-emergence” (let alone from the “clandestine” period during which homes and outdoor locations were used) but were rebuilt from the 1920s or later. No particular architectural merit seems to be claimed for any of them and their “value” is largely symbolic. There doesn’t even seem to be any representation of the variation in catholic rites which developed during the centuries of clandestine worship without control or input by Rome during which many of the Christians had to “dress up” their worship with a Buddhist exterior – these practices lived on among “Hanare Kirishitans” on Goto but the listed churches all seem to represent “mainstream Catholicism”. I found another web site with information on the nomination here This ICOMOS-sponsored document is primarily concerned with the issues surrounding preservation (or otherwise) of the churches, particularly in the face of a decreasing Christian population in the remoter areas and the resultant reduction in requirement for some of the churches as religious buildings. It states “As of 2008, the Government is planning to nominate the sites as cultural landscape consisting of churches, villages and their surroundings. In 2007, Nagasaki Prefecture has launched various surveys needed for the nomination which the government is planning to submit in 2010”. Clearly this hasn’t happened, and the document describes how some Christian communities don’t even want their churches inscribed and/or are unable to partly fund the cost of preserving them. It goes on to recommend “The World Heritage nomination should not come as the first and highest priority agenda for a vulnerable community because the listing obviously brings the highest possible tourism development pressure to the communities. If communities are not ready to deal with it, they will be overwhelmed and only shells will remain with no spirit. The World Heritage nomination should be discussed only when the local community clearly defines their way to go for the future”. Not a resounding vote of confidence in the nomination potential!